French Feudal. Maguelonne Counts and Bishops, 11th to 13th century. Silver denier. Denomination : Silver Denier. Mint : Maguelonne. Size : 17.5 x 18.2 mm. Weight : 0.97 grams. Reference : Roberts-4336, Mayhew-120, PdA-3842. 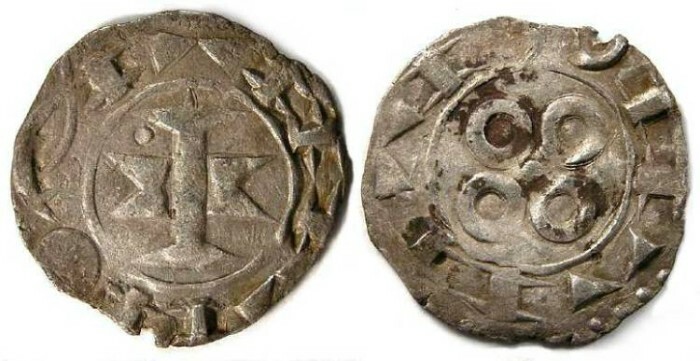 Obverse : Squared cross with RAMUNDS around. Reverse : For annulets with a dot in the centre, with NAIDONA around. The letter forms on this type are so stylized that they are very difficult to read.